Expected symptoms: Minor stomach upset, possible limited vomiting. What to do: Give your child a drink of water to wash the ink down to the stomach. Note: If your child has gotten ink into their eyes, call the Missouri Poison Center now for help on how to rinse the eyes. 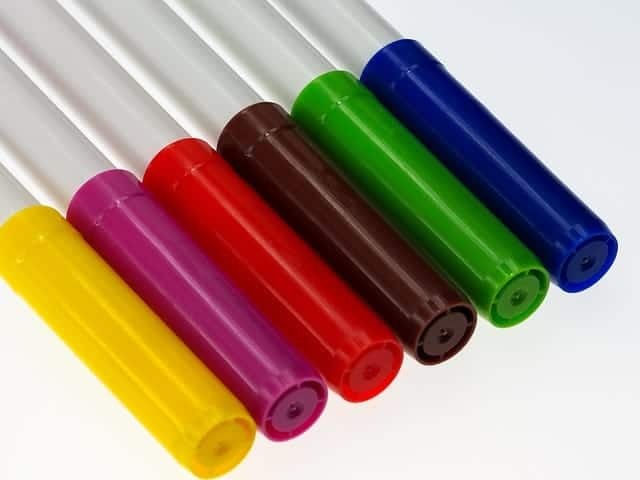 This information applies to markers which include highlighters, dry erase, washable, and permanent markers, and also includes inks found in ball point pens and gel pens. Common calls to the poison center regarding inks involve the school aged child chewing on a pen with reports of it “exploding” in the mouth or a young child chewing on a marker. When ink from a pen or a marker mixes with the saliva it may look like a large amount is in the mouth, but in reality, there is only a small amount of ink available. Inks can be mildly irritating to the mouth and stomach, and rarely causes limited vomiting. If your child has been chewing on a pen or marker, take it away from them and give them a drink of water and wash their hands and face. Eating a small snack can help to decrease the possibility of getting an upset stomach. If the situation involves an exposure to tattoo ink, printer cartridge ink, or fountain pen ink there may be additional ingredients present that can cause more symptoms. Play it safe and immediately call the Missouri Poison Center right away at 1-800-222-1222. The poison center is open all day, every day for poisoning emergencies and questions, too.